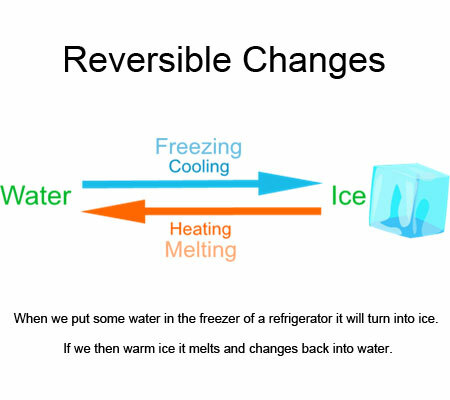 Reversible changes are changes that can be undone or reversed. Give another name for reversible changes. Why we call them physical changes? A reversible change might change how a substance looks or feels (Changing the physical appearance), and it is easy to turn it back again. But it doesn’t produce new substances. E.g. – Water can change into ice. Ice can change into water. Here only the state of the substance (liquid water) changes, but not the substance (water). Following are some of the reversible changes examples. Example (1) – When chocolate is warmed until it melts, the melted chocolate can be changed back into solid chocolate by cooling. Example (2) -When candle wax is heated, the solid wax melts and becomes a liquid. If you cool the molten wax, it becomes a solid again. Example – When orange juice is frozen to make ice lollies, the ice lollies can be changed back into orange juice by heating. Example (1) – If you could capture all the steam that is made when a kettle boils, you could turn it back to water by cooling it. Example (2) – When we put some water in the freezer of a refrigerator it will turn into ice. If we then warm ice it melts and changes back into water. Example (3) – When salt is mixed with water it disappears because it dissolves in the water to make salty water. But the salt can be recovered from the salty water by boiling off the water. Example (1) – When you cut a piece of wood in half, you change its shape. But you do not alter the way the wood is made. Example (2) – When you stretch an elastic band, you alter its shape but it is still made of elastic.